Thank you very much for your illustrations and messages. Your messages encouraged us. Tohoku area is damaged by the great tsunami, and besides, fukushima No.1 nuclear power plant has serious trouble. 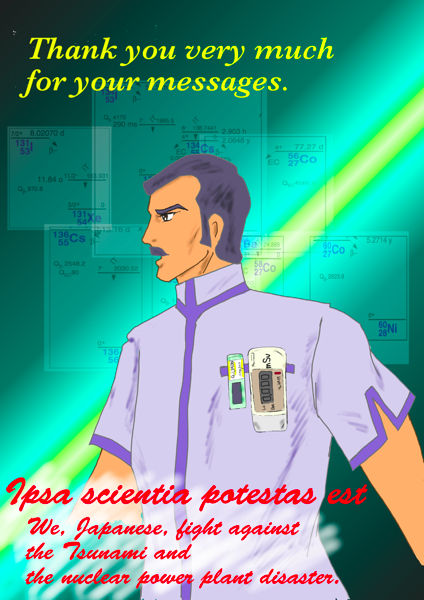 In this drawing, Dr. Umon put on a gamma-neutron monitor and a glass badge. Background image contains decay diagram of radioisotopes. The Latin script means “knowledge is power”. このエントリーは 2011/4/1(金曜日)-05:01 に、カテゴリー グレンダイザー, 創作, 雑記に投稿されました。 RSS 2.0 feedを用いて応答を追跡できます。 You can skip to the end and leave a response. Pinging is currently not allowed. It hase been a pleasure to give you a little sign of our affection. Thanks for posting your drawing on our forum!